Over fifty years since his first publication, Heathcote Williams continues to chart both the injustices and deeply felt poetics at the heart of the human experience. His masterly new investigative poem and book BADSHAH KHAN: ISLAMIC PEACE WARRIOR is an exemplary study of a neglected Angel on Earth. 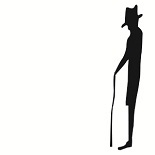 In writing this book, Mr Williams has continued to create and define a new genre; that of poetic journalism and biography, continuing a series of works including THE RED DAGGER, KILLING KIT, THE RUFF TUFF CREAM PUFF AGENCY, DAVID CAMERON STRANGLES KITTENS and his evisceration of the British Monarchy; ROYAL BABYLON. Such works draw our attention to predicaments and individuals who necessitate scrutiny. And there is no better example of that than the figure of Peshawar born ‘Shah of Shahs’ Badshah Khan himself. A close friend and companion of Mahatma Gandhi, this ‘Pashtun 6 foot 5 giant of a man founded an Islamic Peace Army of ten thousand unarmed ‘soldiers’ while the sectarian conflict that would pull India apart in the late 1940’s raged around them.’ In the current climate of suspicion and residual fear felt by the west towards the nation and movement of Islam, it goes without saying just how important it is to consider and review the life and work of one of its most positive proponents. The exactitude shown by Williams in this masterly poetic portrayal demonstrates one of his many stunning characteristics as a Writer, Poet, Journalist and Polemicist; the simple ability to educate and enlighten the public’s ignorance of some of the darkest and most important areas of its own history. 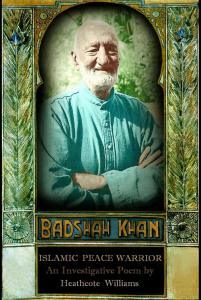 Born in Afghanistan, Abdul Ghaffar Khan, as the son of a benign tribal Shah, devoted his life to nonviolent protest. It was these actions and stance that this epic poem reflects and dignifies. Categorised by Williams as ‘Weaponised goodness’, Khan’s defiance of British rule led to a 27 year imprisonment – thereby equalling Nelson Mandela’s status as an ultimate Prisoner of Conscience for the age, as well as enduring numerous, frequent torturing at the hands of the British. A jihad in reverse as we now understand it, but defined by Khan in his lifetime as the spreading of love and understanding between all men. The poem describes how Khan strove to break the ‘useless customs’ of imperialism and its practises, offering instead only the clear sighted values of wisdom and equality, thereby unifying all religions by stating that ‘belief in God is to love your fellow man.’ The brutality that he faced in trying to deliver that message exposes the limitations of not only all of those corrupted in the West, but also those who seek to misread and misrepresent a sense of belonging to and ownership of your own territory. Those on any side willing to use the suffering of others to justify their beliefs are not the soldiers of God, but rather the defenders of their own weakness. The style of the book is crucial. One of Einstein’s concerns in developing the Theory of Relativity was to ‘unify the fields.’ Heathcote Williams unifies the fields of poetry, Biography and journalism effortlessly in this poem, with a writing style that combines extensive research with poetic reflection and contemplation. The result is an active linguistic philosophy: a uniquely considered response to events delivered to us in a language that is both educative and accessible. Williams, one of the great stylists of the 20th Century has developed a poetic voice that simplifies and elucidates. It is a kind of wave populated by the facts and details he wishes to communicate. There is a great deal of reported speech and quotation in the book, which blend seamlessly with the pitch and rise of the narratives presentation of facts. This sensual aspect of Mr Williams’ writing is one its major areas of appeal. Anyone familiar with his acting roles in film, or Audiobook recordings will recognise how the smoothness and honeyed rasp of his speaking voice is resonantly echoed in his written one. He is both Teacher and Lawyer, representing the information and accused by his insistent and rigorous examination of his subjects opposing forces, whether they be Khan’s postwar British persecutors or the Japanese Whale Hunters, skewered effectively in his iconic WHALE NATION. Too often poetry falls prey to trends or indulgence. Williams’ work as a whole, and this book as its most recent example, easily resists that state of affairs. It creates and consolidates its own approach in a seductively measured blank verse style that seeks to dignify and embody the inspirational human being it honours. Khan’s deep understanding of the spiritual response and his spirited defiance of oppression granted him the transcendent courage quoted in the text. His extensive struggle is made all the more relevant by the fact that Afghanistan was the site and subject of his labours. Williams encapsulates the history of this area through his detailing of Khans’ endurance, balancing it chillingly with a study of Afghanistan’s role as target for the machinations of the American War machine and their attempt to nullify neighbouring Russia’s hold over the area. Reagan’s warmongery is exposed once more as is Obama’s recent pride at his Tuesday Morning Kill List, with former President Clinton’s phallic missiles affectionately termed as Lewinsky’s giving us the darkest of final laughs. Throughout all of this the purety and character of Khan shines through, showing us that those who represent the culture we espouse are as barbaric and inhumane as our imagined eastern enemy. The true Prophet is not concerned with religion but simply with the human impulse. In an increasingly ignorant age, history and religion show us that they are questioned, denied or misunderstood far too often. This book and the life it conveys shows how the direct prophecies of love and understanding are the most relevant. Making the ill informed understand that is therefore the only true task. Khan offered the means to love and to defend that love honourably. He saw nonviolence in a violent world as the highest form of devotion and asked and suffered at the hands of those only ready to hate. Ghaffar Khan died in 1988 at the age of 98, a near century of life that bridged the divide between sectarian violence and spiritual action. This new book by Heathcote Williams not only contains that life but reflects its achievements in the shine of Thin Man Press’s ninety beautifully packaged pages. The hands and hearts of both Williams and Khan have been joined in this book, along with all of those who accompanied and continued the struggle against ignorance and oppression. The wound, if not healed, now shines through. (Trans) May you never grow tired.